Have you been paying attention to the Women's World Cup? Hope you have a cardiologist on speed dial, because this entire tournament has been a nerve (and heart) destroyer. Here are some highlights from today's seesaw match between the US and Japan. The game's first goal didn't come until well after halftime, when the US's Alex Morgan booted one in. 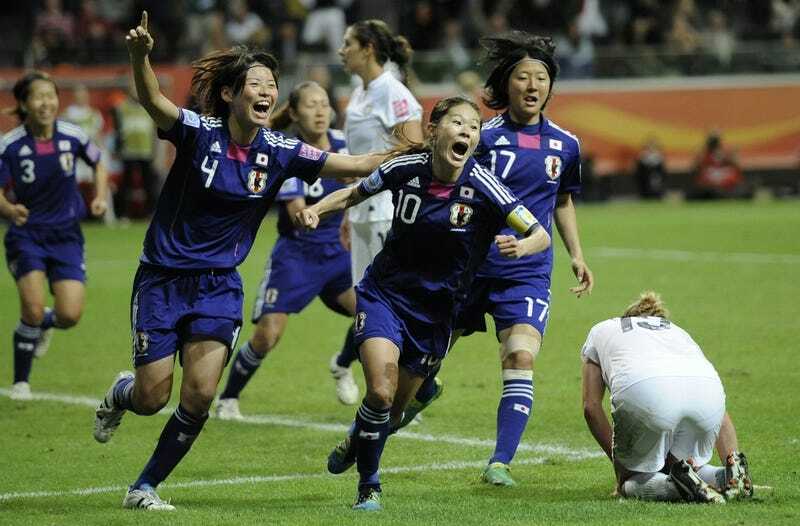 Japan echoed shortly thereafter, tying the game 1-1 going into extra time. Abby Wambach, with her golden cranium of justice and freedom, scored on a header in extra time, only to have Japan's Homare Sawa respond with a beautiful goal of her own. The US was unable to score before the clock expired, sending the game into a shootout. An ailing Hope Solo wasn't able to stop the Japanese feet, and the women picked to kick for the US couldn't produce (with the exception of Wambach). Japan won the shootout 3-1, and they're the new World Cup Champions. I don't smoke, but I feel like I need a cigarette. The US women's team reacts after the shootout with Japan.